Quintin Wirginis, a 2014 graduate of Fox Chapel Area High School, earned a bachelor’s degree in communications from the University of Pittsburgh in December, and now is working toward a second degree in sociology. 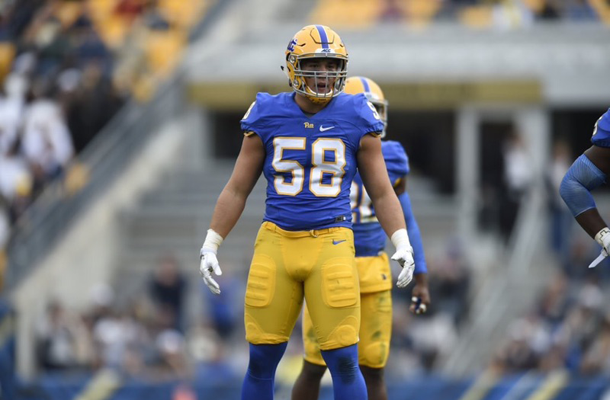 A fifth-year red-shirt senior on the Pitt Panther football team, Quintin played his first three years before an injury kept him out of the game last year. When he was a student athlete at Fox Chapel Area, Quintin was voted all-conference twice, and was a four-year starter whose athleticism enabled him to playa myriad of positions, including safety, wide receiver, linebacker, and tight end. He also played basketball for three years. Quintin: Besides going to school for my second degree, I’ve been working out a ton with the team and our strength and conditioning staff, and doing some senior leadership-led football drills. I’ve also been volunteering at some of Pitt’s youth football camps and camps for prospects, and helping out with the Cathy and John Pelusi Family Life Skills Program at Pitt that helps student athletes find success in all areas of their lives, not just athletics. 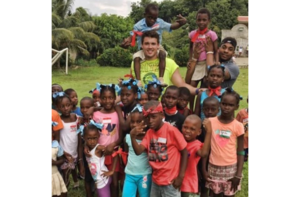 I went to Haiti in May with Pitt’s Fellowship of Christian Athletes. I went last year with the same group. We stayed at an orphanage and went to a handful of others to build relationships with the kids. We got them involved in athletics, faith-based activities, and were there to help them with whatever they needed. Q: Did your high school football experience prepare you at all for the rigors of NCAA Division I sports? Quintin: I think so. College play is on a whole different level, but I think high school athletics in general did prepare me. Plus, I was surrounded by good, hard-working coaches and teammates. Playing for Fox Chapel Area also gave me an opportunity to compete against some of the best competition in the WPIAL and PIAA, and that prepared me for the level I’m playing at today. Q: What were your biggest challenges when making the transition? Quintin: When you get to college, you only get a few weeks off a year and that goes for school too. Balancing football, academics, a social life, and my faith-based priorities is a difficult thing. I think a lot of people have difficulty dealing with that balance. I found what worked best for me was finding some sort of consistency that I could live with. But I’m still working on it. I don’t think anyone completely masters it, but I’m definitely a lot better at it. It can be super overwhelming at first and there are a lot of distractions. Q: Unfortunately, many athletes face injuries at some point in their careers. You went through this yourself last season and missed the entire year. How did you get through it mentally and how did you work your way back? Quintin: It’s one of toughest things I’ve had to go through in my life. I’ve always had tremendous support from my family, friends, and teammates, and they have helped me through it too. But when a lot of your identity is tied into athletics, and you’re not doing the things you’re used to doing as part of your daily life, it can really get to you. I was a little depressed last year because I felt like I was letting so many people down. It was like a horrible déjà vu because I also sat out my senior year of high school. But you have to put it into perspective, and now I’m more focused on the fact that everything happens for a reason. I really feel that I’m better off than I was a year ago and am so thankful to have an opportunity to come back and play another year. I’m much more mature now and ready for this season and the rest of my life. Q: How do you think Pitt will do this year? Quintin: Each year everyone says, “this is our year,” but I genuinely believe this truly is our year. I’m fortunate to play with the guys I came in with as a freshman and when you come in as a class it gives you a lot of confidence because you’ve played together for a long time. There’s a ton of athleticism and ability in this class. As a middle linebacker, I can speak for the defense in saying I’m confident we’ll have the best defense since I’ve been here. I can speak for special teams as well – our skills this year will be above all of the rest of the time I’ve been here. Q: What is it like to step onto the field for the very first time as a Division I college player? Quintin: I remember running out of the tunnel and just looking up in the stands and seeing my family and so many people. The entire day was a complete blur. It was like a dream. It’s very emotional because you’re finally where you’ve always dreamed of being. You might be nervous, but you’ve also prepared so much and that kicks in, so you settle down and go and do your thing. Quintin: It’s hard to pick one. I’d say my faith has been a huge influence, especially since I’ve gone to college. Next to that, my parents have always had a huge influence on me. The support they give me is incredible. I’ll never be able to pay them back for what they’ve done for me and that goes for the rest of my family. I’m the youngest of seven kids and the support I get from them is unparalleled. Q: What would be a perfect day for you? Quintin: A perfect day for me would be waking up on the road at a hotel, getting ready to play in the national championship, and winning. Then, just being with my teammates and, after the game, celebrating with my family. That would be the perfect day for me. Q: When you’re done with your football career, what will you do to fill that void? Quintin: I definitely find a lot of joy helping and guiding people, so I plan to do that in anyway I can. One of purest forms of joy is helping others. I want to have a positive influence on the people around me.